SCCM CB 1803 preview version is released a few weeks back. I was busy with SCCM CB 1802 production posts so I couldn’t get time to install SCCM 1803 preview version. In this post, we will see the review of my SCCM CB 1803 upgrade experience. If you have not installed SCCM preview version in the lab then, I would recommend to download and install the latest preview baseline version SCCM CB 1711. The above download link should be used ONLY when want to test the Preview version in your LAB environment. The SCCM CB Preview version is valid only for 90 days or 3 months. This version should NOT be installed in the production environment. The SCCM preview version supports maximum TEN(10) clients. I have created a video tutorial to provide a real experience of SCCM CB 1803 upgrade process. Also, this video tutorial helps to give a real experience of new features included in the 1803 preview version of SCCM CB. Subscribe the YouTube channel to get latest updates about SCCM/Intune video tutorial. Watch SCCM 1803 step by step upgrade video and features review! Once you have upgraded SCCM client and Server to 1803 then, you can now create a customized tab to open a web page in Software Center. How to Create Custom Tab in SCCM Software Center – In Client Settings, select the Software Center group. Specify a tab name and content URL for the customized tab. Upgrade the SCCM CB client to 1803 and launch Software center. 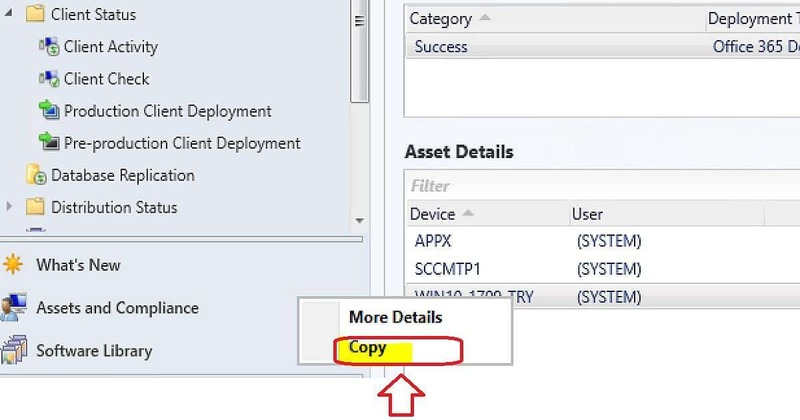 Enable copy/paste functionality in the asset details pane in deployment and distribution status monitoring views. You can now enable configuration of ‘Allow signed updates from an intranet Microsoft update service location’ policy and installation of Windows Server Update Services code signing certificate on clients. I have posted about this feature. I would recommend reading that post SCCM CB 1802 Enable Third Party Software Update Support. The WDS requirement is removed from PXE enabled DPs. This is possible if you are NOT using the multicast feature. Configure a PXE-enabled distribution point to use a PXE responder service that supports IPv6 and does not require Windows Deployment Services (WDS). Maintenance windows details are displayed in software center of the client machine. This is useful in troubleshooting scenarios for help desk. Software Center now displays the next scheduled maintenance window on the Installation Status tab. SCCM Client Peer cache is improving with every release of SCCM CB. Client peer cache sources can now divide content into parts. These parts minimize the network transfer to reduce WAN utilization. Now you can set a cloud distribution point as a source for a pull distribution point. I could see new management insight option in SCCM 1803 console “\Administration\ Overview \ Management Insights\All Insights\MacOS and Unix“. It seems that SCEP for Mac and Unix will be depreciated by the last release of SCCM CB in the year 2018.